The United States Botanic Garden (USBG) and Architect of the Capitol (AOC) are restoring the deteriorating stone facade and roof of the historic USBG Conservatory. Aside from a modest addition at the rear of the building, the historic Conservatory exterior remains unchanged from its 1933 appearance. The USBG Conservatory contains two courtyard gardens and 10 garden rooms under glass, totaling 28,944 square feet of growing space, and also has two exhibit galleries. The USBG is one of the most visited public gardens in the United States, welcoming more than 1.2 million visitors annually. Why is the Conservatory facade and roof under restoration? Years of weather have led to discoloration, cracking, and deterioration of the facade and decorative features. Water proofing on the roof has failed, leading to damaging water infiltration. What are the benefits of the project? The project will restore damage to the limestone facade and restore the integrity of the roof, preserving this 83-year-old historic building for decades to come. The USBG will remain fully open and accessible throughout construction. During construction, the stone facade will be fenced-in, but accessible paths around the Conservatory will remain open. 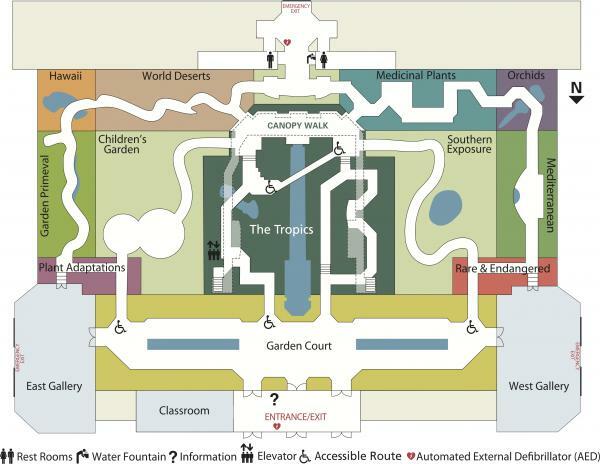 Access to the National Garden will remain available through two entrances on Maryland Avenue SW and Independence Ave SW. Some of the restoration work could create noise, but will occur before the Conservatory opens and have minimal impact on visitors. Plants appeal to the senses - visitors of all ages are captivated by the sights, smells, sounds and textures that surround them in our Conservatory. 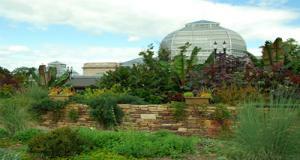 The U.S. Botanic Garden is a museum with a difference. Our artifacts are the living treasures of the plant world. The towering leaves, graceful flowers, delicate seeds and exotic fruits of plants at their peak are displayed artfully throughout the historic Conservatory. Garden Court: The colorful foliage and flowers create a beautiful setting to feature economic and ethno-botanical plants used in products that provide our fibers, food, beverages, cosmetics, wood, species and more. The Tropics: A tropical rainforest overtakes an abandoned plantation. The dome rises to 93 feet and has a mezzanine level from which to view the jungle canopy. Plant Adaptations: Shows some of the fascinating adaptations that have evolved in the plant world. Garden Primeval: A reconstructed Jurassic landscape of ferns and other ancient plant groups that have survived for 150 million years. Hawaii: A collection plants native to Hawaii, where species have adapted to live in the specialized conditions of the remote volcanic islands. World Deserts: Filled with succulents, grasses, shrubs and other flowering plants. Medicinal Plants: Explores the origins of plant medicine and displays a collection of medicinal plants from all over the world. Orchids: An ever-blooming, ever-changing display of these mythic plants. Our orchid collection numbers about 5,000 specimens, with hundreds on display at any given time. Mediterranean: Explore the plants, culture, and food of the world's Mediterranean climatic regions. Rare and Endangered Species: A changing display of rare, threatened or endangered plants and habitats. Southern Exposure: A micro-climate outdoor garden featuring North American plants native to the Southeast, the Southwest, and Mexico. West Gallery and East Gallery: Host seasonal exhibits designed to delight, educate and inspire visitors to become more active stewards of the plants that support life on earth. Constructed by the Architect of the Capitol in 1933, this historic Lord & Burnham greenhouse contains two courtyard gardens and 10 garden rooms under glass, totaling 28,944 square feet of growing space. Behind the scenes is a state-of-the-art completely automated environmental control system. Computers monitor the outside weather and automatically control misting, shade cloth, fans, air-handling equipment, heat and window vents to achieve a perfect range of day and night temperatures and humidity. In 2001, the Conservatory re-opened after a four-year renovation to replace and modernize its building systems, while retaining its architectural character. Aside from a modest addition at the rear of the building, its exterior remains largely unchanged from its 1933 appearance. The Conservatory's aluminum framework, glazing, interior floors, doors and lighting were replaced; all electrical, plumbing and environmental control systems were upgraded and air conditioning was installed in certain locations. The renovation has made the Conservatory totally accessible and provided improved visitor services. See a brief time-lapse of the renovation.